Do you use the EQ Profile with everyone you work with? I don’t. (Uh oh. Maybe I shouldn’t admit that). I do use the EQ Profile with every team I work with because I want to know what I’m getting myself into when I challenge them. (See an example of our new EQ Playbook for Teams here). And I don’t use the EQ Profile right out of the gate with every coaching client. I want to look for signs that the client is essentially asking for EQ Profile before I introduce them to it. When I say asking for it, I mean that my clients expect me to help them see what they can’t see about themselves. 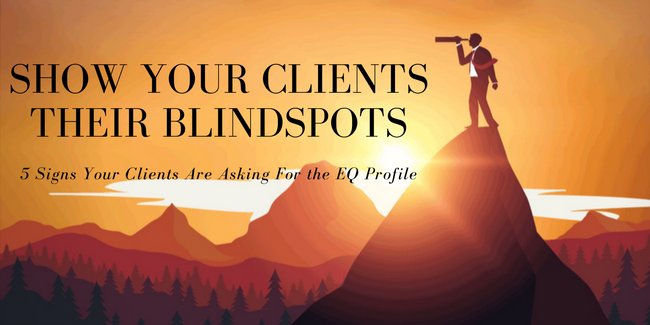 And when a client’s blindspots become apparent to me (and not so much to them), I’ve found that is the ideal time to introduce the EQ Profile to them, to help them see themselves more fully. Do you want to become an expert at identifying your client’s blindspots? As an EQ Profile Practitioner, you can take advantage of a special offer for our upcoming refresher course. 1) Their focus is outside of themselves. Sally was exasperated with her boss. “He’s micromanaging my department. He’s never available. He leaves me out of meetings that affect me and my department.” And I would ask Sally, “What do you want around this?” to which she would respond “He won’t let me do my job. The board believes in me, but he doesn’t. Other companies would love to have someone like me on their staff.” And I would return to the question “And what do YOU want?” and she would continue with her latest grievance about her boss. Her focus was almost completely outside of herself (a strong indicator of Other Orientation), to the point that she was nearly blind to what she felt, thought or wanted for or about herself. This was a big billboard of a sign that she would benefit from the EQ Profile (and developing a deeper understanding of Other Orientation). The EQ Profile provided the platform to discuss where we tend to focus under stress and how one can cede the locus of control to another without even realizing it. With this new awareness, Sally has become significantly more empowered, more confident in her role and her boss has backed off, giving her more space to perform. 2) Their difficulty in seeing what’s possible. Jeff was one of my most challenging clients. We would start most every session by identifying what he wants to have come out of the session. We would explore his situation, his relationship to the outcome he’s wanting and what his options are. And one by one, he would explain in detail why anything we talked about wouldn’t work. And I would ask “what else is possible?” And we’d explore another option, which he would meticulously dismantle. And I would ask “So what is possible?” And by the end of most of our early sessions, he’d talked himself out of every possibility we explored and was returned back to where we started the session. Jeff couldn’t see or believe in what was possible (because of his strong Negative Orientation). After the EQ Profile, Jeff gained some perspective about how differently he saw himself, others and the world, under stress. He was able to reflect on how he had been successful in situations of uncertainty in the past and came up with a way of framing the future that helped him get his head around it (e.g. we’ll probably never be able to do this, but if we did by some miracle in the future do it, here’s how we would have done it – kind of reverse engineering a vision). It works for him and gave him the shift he needed to move forward. 3) They are not accessing their feelings. Bill didn’t have access to his feelings. He didn’t know what he was missing. And he was missing the essential information that his feelings would provide him. Information that could help him save his relationships. Introducing Bill to the EQ Profile gave me the platform to talk with him about the information that feelings provide and how not accessing distressing feelings can impair authentic relationships. The language of feelings is somewhat foreign to Bill and he’s slowly but surely learning to speak it. 4) Their Inner Critic is merciless. A serial entrepreneur, Randy’s life and career were like a roller coaster, with lots of ups and downs. Randy had a merciless inner critic that shamed him relentlessly. When Randy obeyed the Inner Critic, he was thin and buff and on top of his business game (while his sleep and relationships suffered). And when Randy didn’t do everything his inner critic demanded, he felt like a failure, packing on pounds and doubting his business abilities. When I introduced Randy to the EQ Profile, it gave us the opportunity to talk about shame and how it can be healthy for us in good measure and how it can make us miserable (as well as those around us) when we let the shame drive the bus. Also, it gave us the opportunity to talk about the role of the inner critic, to give it a name and to discuss the role it plays in Randy’s life. When we developed strategies for Randy to simply notice the voice of his inner critic and observe it as witness, he was able to find some distance from it and make more conscious and healthy choices. 5) Their boss and subordinates love them – their peers, not so much. Jane didn’t understand the mixed messages in her 360 feedback. Jane’s people loved her. They felt seen by her, supported and engaged by her. To her boss, Jane was indispensable. She always seemed to know what needed to be done and she was a problem solver, quick to step into action to fix whatever was broken. Jane’s peers had a different experience. They didn’t trust her. They felt she was trying to compete with them, make them look bad. Jane felt like she was the same person with everyone. She didn’t understand how people could see her so differently. Her peers just didn’t know her. They didn’t understand her. (And let’s face it, they weren’t that smart, anyway). The EQ Profile helped Jane gain some clarity about her relationship strategies, the ones she was comfortable with and the ones she wasn’t. Jane wasn’t comfortable depending upon someone else, especially when the chips were down. If the going was going to get tough, she was going to get going. She wasn’t going to wait for someone else. And Jane didn’t really realize this about herself until the EQ Profile debrief of her relationship strategies. And it brought all of her 360 feedback into perspective. There you have it. Five signs that your client is asking for the EQ Profile. Are your clients asking you for the EQ Profile? Are they missing some perspective? Do their issues sound the same? Is there a pattern to your coaching sessions? If so, your clients might be asking you to help them see what they can’t. The EQ Profile can support you in showing your clients themselves and what they’re missing. With the EQ Profile, you can open up all new choices for your clients that would never have been available to them otherwise. Wow! What a gift you have to give them. Many of our EQ Profile Practitioners have found that taking a retraining course is an excellent way to get clearer on how to use the EQ Profile to go deeper with your clients faster. Our next virtual EQ Profile refresher training starts October 19th. Already a practitioner? For a limited time, we’re offering 2 free EQ Profile’s with the purchase of our EQ Profile Certified Coach Retraining Course. That’s worth over $300, which is more than the price of admission. This offer ends on Oct 6th so be sure you register before then here. Please email our team at liat@learninginaction.com if you have any questions.